A medium-rare steak is 135 degrees in the center. For thousands of years, the best way to accomplish this was to put the steak on a really hot grill and attempt to pull it off at just the right time. This is silly. Fortunately, technology has found a better way. Take your steak, vacuum seal it in a plastic bag, and then lower it into a water bath whose temperature is carefully maintained at exactly 135 degrees. Let the steak come up to the temperature of the surrounding water, then pull it out, sear it with a blowtorch or a hot pan, and you’re ready to serve! This method of cooking (known as “sous-vide“, French for “under-vacuum”) has several advantages. 1) No clean-up. Just open the bag, torch the steak, and you’re ready to serve! 2) No overcooking. Overcooking means accidentally bringing food above your target temperature. With sous-vide, the water bath maintains your food at the exact desire temperature, so overcooking is impossible. 3) No food safety concerns. Want a super-rare hamburger, but worried about e. coli? Pasteurization is a function of both temperature and time, so you can pasteurize your meat at a relatively low temperature by just holding it there for a couple hours. Fish takes about 20 minutes and is perfectly cooked every single time. Chicken is moist and tender in a way I’ve never had it before. Sous-vide duck is amazing. After 2 hours, it’s deep red and juicy, unlike the dry grey stuff I had at Chinese restaurants growing up. Flank steak is one of the most flavorful cuts, but is usually one of the toughest. After 2 days in the sous vide, it’s as tender as filet mignon. I have no desire to eat out anymore, because the food I make at home is faster and tastier. “Making dinner” now consists of taking a piece of meat (still in its original vacuum-sealed packaging from the supermarket) and dropping it into my sous-vide. For vegetables, I blend a spinach smoothie, or if I’m feeling fancy, I’ll put a tray of broccoli in the oven to roast. I can prepare an entire dinner in less than 60 seconds. You can buy a countertop sous vide machine for $450. Alternatively, you can build your own for about $75. I did neither, and bought a temperature controller that I can plug a rice cooker into. It’s cheaper and more flexible than a dedicated sous-vide machine. It has lower risk of electrocuting me than a DIY solution. And finally, if I ever want to sous vide something larger (say, an entire animal), I can just swap out my rice cooker for a larger heating element and I am good to go. Update: I’ve been informed that there are cheaper alternatives. I get my meat from Trader Joes already vacuum sealed. You might eventually want a vacuum sealer or a water bath that can handle larger items, but the above setup has been working great for me. Soy ginger cod 132 20 mins Find it in Trader Joe’s frozen foods aisle. Thaw first. Pork belly 155 2 days Leave it under the broiler afterwards to get super-crispy, and don’t forget plenty of salt! I write about software, with deep dives into product management, design, and analytics. Sign up for my occasional newsletter and I’ll send you something interesting every few weeks, starting with a guide to fighting false negatives during new feature development. This is awesome. I’ve been looking for details on the setup. Now I can feel like a mad scientist while I cook my food :). 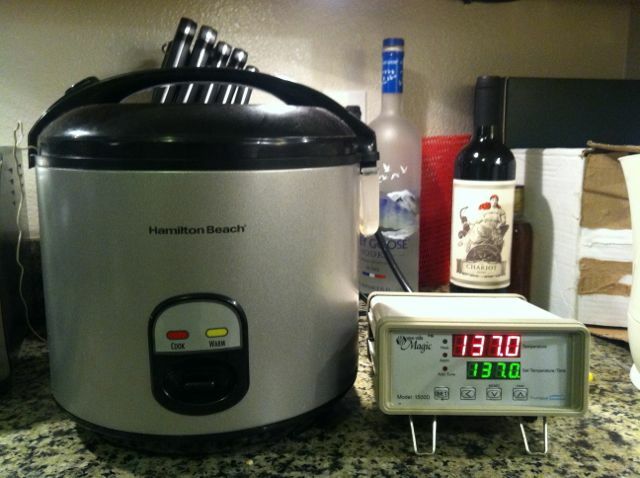 Have you read “Consider the Fork” its got a great writeup on souse vide. Your timing of this article was perfect as I wanted to learn more. Thanks for sharing. Product @ClassDojo. Previously PocketGems VP, Playdom, Tableau. I like technology, product management, design, social psychology, economics, data, and puns.